James Comey had a lot to say in front of lawmakers. James Comey kept memos of his meetings with President Donald Trump because he was worried he would lie about their interactions, he told the Senate Intelligence Committee on Thursday. The former FBI director said he felt the need to document his time with Trump because they were alone, because of the subject matter, and "because of the nature of the person" in sworn testimony. "I was honestly concerned that he might lie about the nature of our meeting," he said. U.S. stocks were modestly higher as Comey testified that Trump's decision to fire him "confused" him and slammed the administration for defaming the FBI. "I understood that I could be fired by a president for any reason or for no reason at all," Comey said. "The shifting explanations confused me." He called the administration's efforts to "defame" him and the FBI after his ouster "lies, plain and simple." He said there is no doubt that Russia interfered in the 2016 election. "That's about as unfake as you can possibly get," he said. Comey declined to say whether President Trump's encouragement to scrap his investigation into ousted National Security Adviser Michael Flynn was obstruction of justice. "I don't think it's for me to see whether the conversation with the president was an effort to obstruct," he said. He said he took Trump's "hope" that he would let the investigation go as a direction. Of the president's Twitter threat that he "better hope" there were no tapes of their conversations, Comey said, "Lordy, I hope there are tapes." He said the tapes tweet spurred him to ask "a friend of mine" to share the memo he had written about his conversation with Trump with a reporter. "I thought it might prompt the appointment of a special counsel," he said. Comey's testimony fanned the flames of the questions surrounding Attorney General Jeff Sessions. He said there are "facts I cannot discuss in an open setting" that made him believe Sessions had to recuse himself from the Russia probe and that Sessions and Trump's son-in-law Jared Kushner knew he shouldn't have been left alone with the president. 'It can't happen that you get kicked out of the room and the president talks to me," he said he told Sessions after Trump privately asked him to drop the Flynn probe. Much of Senator Kamala Harris' questioning honed in on Sessions. Comey stole the show on Thursday. In an off-camera with reporters on Thursday, Deputy Press Secretary Sarah Huckabee Sanders pushed back on Comey's assertion that Trump might lie. "I can definitively say the president is not a liar," she said. President Trump's personal lawyer, Marc Kasowicz, issued a statement after Comey's testimony in which he said the president never asked Comey for his loyalty or asked him to "let Flynn go." Wall Street, like most of America, buzzed in anticipation of former FBI director James Comey's hearing before the Senate Intelligence Committee on Thursday. Markets are watching closely on a day with especially elevated political stakes, not only in the United States but overseas in light of the U.K. election and European Central Bank meeting. Comey told the Senate committee that President Donald Trump repeatedly asked him to lift "the cloud" over his administration, according to prepared remarks released on Wednesday. He will also provide details on Trump's request he scrap the Michael Flynn investigation, describe the president's attempts to secure loyalty pledges, and his insistence that Comey somehow help "get out" information that Trump personally was not under investigation in the Russia probe. "[The president] described the Russia investigation as "a cloud" that was impairing his ability to act on behalf of the country. He said he had nothing to do with Russia, had not been involved with hookers in Russia, and had always assumed he was being recorded when in Russia. He asked what we could do to 'lift the cloud,'" Comey will say. Wall Street will be looking for signals from Comey on what may be to come on Trump, Russia and the White House. 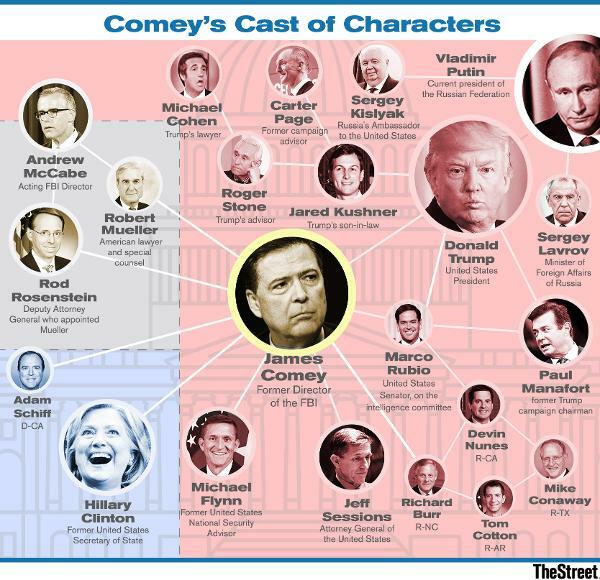 Comey has proven himself to be a market mover in the past. 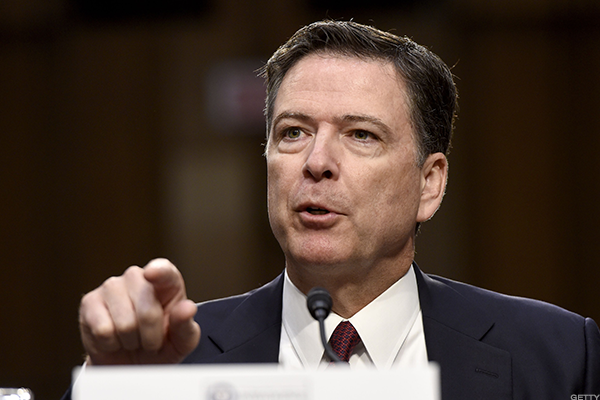 "Former Director Comey's written statement was methodical, and at times uncomfortable, but it didn't break new ground," Compass Point Research analyst Isaac Boltansky wrote in a note on Thursday. "This hearing should prove compelling, but our sense is that it will ultimately be procedurally anticlimactic as both legal and political questions will persist." Boltansky added that Trump's tweets, not Comey's testimony, would prove most politically potent. The president does not have anything on his schedule until noon. He will watch the hearing in the White House dining room with his legal team and closest advisers, Bloomberg reports. "While it is unlikely that Comey will divulge additional details about investigations into current and former Trump administration officials, we think today's testimony could nonetheless be impactful if senators are able to draw out new headlines about 'pressure' Comey felt to end the investigations and 'lift the cloud' over Trump, as the President allegedly put it," Height Securities analyst Peter Cohn said in a Thursday note. "Our view remains however that unless we see rank-and-file Republicans who have been loyal to Trump thus far break ranks, the odds of impeachment or forced resignation remain low (15%) as long as Republicans control Congress." Jim Paulsen, former chief investment strategist at Wells Fargo Asset Management, told Politico Comey's testimony could be a trading event, albeit a short-lived one. "Traders will use headlines to move market prices intraday. However, I doubt it will have much lasting impact," he said. "Even if Trump derailed, it is not like he had any momentum to go off the rails anyway. Expectations for Trump to get anything done of substance soon have all but evaporated anyway." Comey has moved stocks in the past. Two other Comey-centric events -- his confirmation of the Russia investigation and reports of his memo on Flynn -- wiped $500 billion off of markets. The hearing is expected to go until about 1:00 p.m. ET, when it will go into closed session. Alibaba (BABA - Get Report) shares are going bonkers following up an upbeat investor day. Tesla's (TSLA - Get Report) shares continue to be unstoppable. They are hovering near a record high of $359.65. But, the company was dealt a rare blow in terms of board composition. FANG stocks -- an acronym for Facebook (FB - Get Report) , Amazon (AMZN - Get Report) , Netflix (NFLX - Get Report) and Google (Alphabet) (GOOGL - Get Report) also continue to be red-hot. But chip-maker AMD (AMD - Get Report) also continues to notch big gains amid the rush to bitcoin. Meanwhile, rival NVIDIA (NVDA - Get Report) caught a massive upgrade by Citigroup.